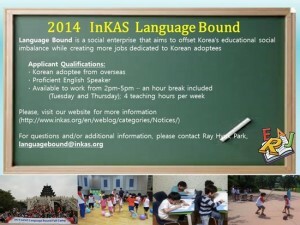 Language Bound is a social enterprise that teaches English to children from impoverished backgrounds. As much as knowing English is an asset measured for today’s success in Korea, affording English courses is often reserved for the upper class. By offering higherEnglish education to low-income children, Language Bound’s goal is to offset Korea’s educational social imbalance while creating more jobs dedicated to Korean adoptees.